Rejoice Spinosaurus hunters! If you missed your chance at capturing this elusive species during Target’s less-than-ideal stocking of the Legacy Collection version of the figure, Walmart is here to save the day. 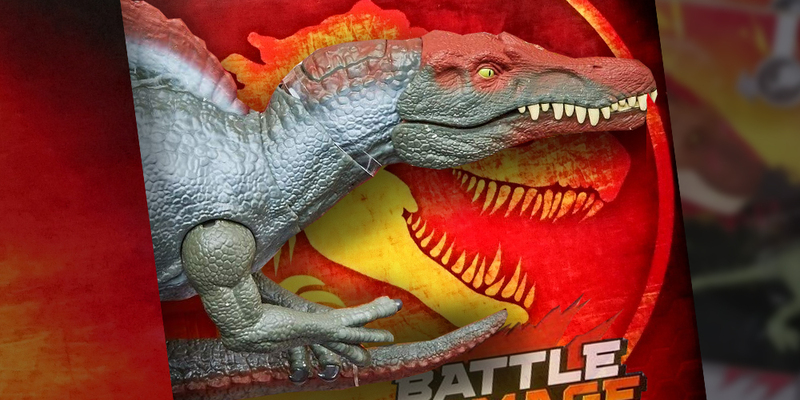 According to Brickseek, a third-party inventory checker for major retailers like Target and Walmart, there is now an entry in Walmart’s system for a Battle Damage version of Mattel’s Spinosaurus. While not much is known about the new figure at this time, Collect Jurassic can exclusively confirm that it sports all-new paint deco with a Battle Damage feature unseen in previous figures. Most importantly, it is not a cancelled item at this point and will be releasing in Walmart as planned. When that is, we can’t be sure—but the barcode number for the Battle Damage Spinosaurus is located sequentially in between other 2019 Mattel Jurassic releases. Take that as you will. As always, we’ll post any updates here on collectjurassic.com, as well as on our Instagram, YouTube, Twitter and Facebook pages. Follow and subscribe so you don’t miss a thing! Note: The image accompanying this article was created for illustrative purposes only. Awesome news. Is it an actual all-new battle-damaged variant or a repack of the Legacy one? It looks largely the same in that image but the battle damage is likely not visible. Meaning the original Legacy one is likely still quite valuable. In any event, great to see we’re getting another Spinosaurus from Mattel. Just updated the article to state the image is just for illustrative purposes, sorry for any confusion! As you said though, the Legacy version will most likely remain quite valuable. I’d imagine this version will have a new color scheme, as opposed to the movie-accurate coloration of the Legacy version. Meaning those who want a perfectly movie-accurate Spinosaurus will still need to seek out the Legacy version. I’ll of course hang onto mine. I hope they keep the same color scheme as the legacy one! It will be an all-new deco, we updated the article with this information. Hi! Before I talk about the Spinosaurus, let me talk about a bit about myself. I live in Australia and I am 10 years old. I love dinosaurs and I am the biggest fan of the Mattel Jurassic World Toyline. The Mattel figures I got is the wave 1 Attack Pack Dimorphodon and Gallimimus, the Roarivore Baryonyx and Pteranodon (Which the roar is broken for the Pteranodon), Battle Damage Dino Rivals Blue Velociraptor, Dino Rivals Wave 1 Attack Pack Delta Velociraptor, Dracorex and Rhamphorhynchus and I even have the Dual Attack Concavenator (Which even though it is not in Australia, my mum got it from eBay for $27.05). I can’t wait to get the new Attack Pack Wave 2 Herrerasaurus and Coelurus, Dual Attack Pteranodon, Mega Dual Attack Amargasaurus and Quetzalcoatlus, Savage Strike Second Blue, Velociraptor, Plesiosaurus, Dilophosaurus and Pachycephalosaurus, Legacy Collection Brachiosaurus and I am even excited about probably my most favourite Mattel dinosaur figures, the Destroy N’ Devour Indominus Rex and the Super Colossal Blue. Sorry if I talk a bit too much about myself. I listen to everybody and I am a kind smart kid at School. I am a huge fan of you because you probably have every Mattel figure. I have seen your YouTube videos and I am proud of that Dino Rivals Pteranodon you got. One more thing, I love that you are getting so much amazing news about the new Mattel toys. Thanks Tim. Onto the Spinosaurus, this better not be another prank like the Bash N’ Bellow Apatosaurus from April Fools because if I don’t see the Battle Damage, I am just gonna go crazy. Thank you! Finally, I needed this Spinosaurus really damn bad. When will it come out? Almost assuredly 2019, perhaps in the fall?